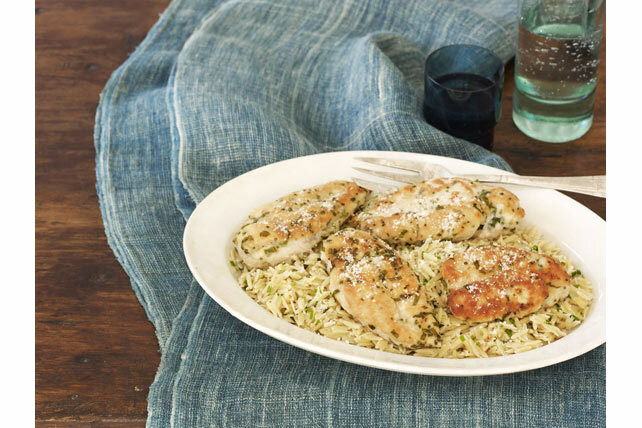 Here's deliciousness at its most fragrant: a simple chicken and orzo dish with fresh basil, chives, lemon grass and garlic. Mix 2 Tbsp. cheese, flour, 1 Tbsp. each basil and chives, and 1/8 tsp. pepper in pie plate. Moisten chicken with water, then dip in cheese mixture, turning to evenly coat both sides of each breast. Heat oil in large nonstick skillet on medium-high heat. Add chicken; cook 3 min. on each side or until done (170ºF). Transfer to plate; cover to keep warm. Add lemon grass and garlic to skillet; cook and stir on medium heat 1 min. Add broth, remaining pepper and 1 Tbsp. of the remaining cheese. Bring to boil; stir in orzo. Cover; simmer on medium-low heat 10 min. or until orzo is al dente. Stir orzo. Return chicken to skillet; cook, covered, 2 to 4 min. or until orzo is tender and chicken is heated through. Transfer chicken to plate. Stir remaining basil and chives into orzo; spoon onto plate with chicken. Sprinkle with remaining cheese. Look for stalks that are a lemony-light green colour on the lower stalk (near the bulb) and fragrant. Avoid purchasing stalks that are loose and coming apart or stalks that are crusty, browned at the tips, lack fragrance or are soft and rubbery. Cut off and discard the bulb and tough outer leaves. The main stalk (yellow section) is what is typically used in recipes. Use a sharp knife to chop the lemon grass. Or, process in a food processor until finely chopped. Note: The upper green portion can be used in recipes where the lemon grass is cooked for at least 5 min.